Company / Firm: K.M. Imports Inc.
Ottawa, October 30, 2015 - K.M. 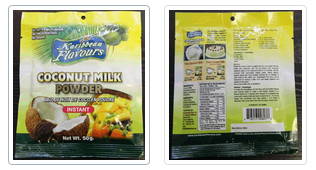 Imports Inc. is recalling Karibbean Flavours brand Coconut Milk Powder from the marketplace because it contains milk which is not declared on the label. People with an allergy to milk should not consume the recalled product described.